Wish You Were Here! 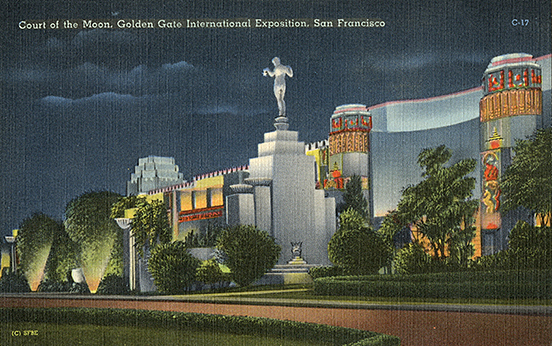 Postcards from the Golden Gate International Exposition is presented by the Treasure Island Museum. In February 1939, the month that the Golden Gate International Exposition opened, my father, Red Ayres, celebrated his twentieth birthday by travelling from his native Visalia to see the Treasure Island fair. He was amazed; his voice was filled with awe as he described the multi-colored lights that illuminated the beautiful grounds. When Pearl Harbor was bombed in 1941, Red enlisted in the United States Navy, serving in the South Pacific on the U.S.S. Detroit. After the war was over, he eagerly anticipated docking at Treasure Island upon the Detroit's return to the states. But he sadly recalled that "The only reason I knew it was the same place was because the Bay Bridge was there." The fair had been almost completely erased after the Navy took over Treasure Island in 1942. I could not picture what my father was talking about. He had no images to show me, for while he was overseas, his mother threw away all his souvenirs. I wondered why he found the Golden Gate International Exposition so fascinating, so after he died I began collecting souvenirs from the fair. Postcards were the most readily available collectibles, with an astonishing variety of images. I soon learned about the San Francisco Bay Area Post Card Club, which meets monthly at Fort Mason Center. Through my association with this club and its highly knowledgeable members, I learned about the various types of postcards and the limitless variety of subjects depicted upon them. Postcards may well be the ultimate collectors' items.They provide a multiplicity of views on every imaginable subject; they don't take up too much room; and with a minimal amount of care, they can look just as good as the day they were printed. Best of all, they are relatively inexpensive compared to other collectibles.The messages in the reverse provide a sense of the time in which they were issued, in the voices of the people who were there. In short, postcards provide charming little windows into the past. It is a great pleasure to be able to share with you a part of my postcard collection here on Treasure Island, the site of the Golden Gate International Exposition.